We have so much and take so much for granted in the US that other parts of the world can only imagine. Things like hot and cold running water at the turn of a tap, or even running water at all. Here is a little photo essay to remind us all of how easy we have it. 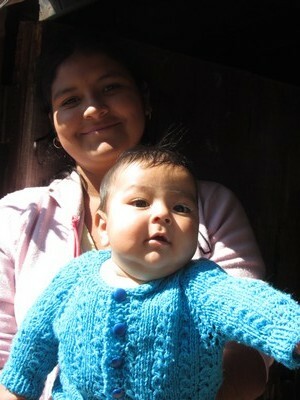 The superintendiente (CO) is in town so that has meant many travels visiting people in their homes. Between mountain climbing in Tetipac, and Indiana Jonesing it in Dolores, I have had my share of adventures right here in Taxco. Taxco is built on several mountains, and I can safely say that, with the exception of the zocolo, a small park area in the middle of town, if you are not climbing up, you are headed down. I have joked about needing to be part mountain goat when walking in some parts of town, and that was true of a recent day in service. We started at the bottom of town, walked up a not too steep hill, past the chickens and pigs, and headed out into the outer reaches where the cobblestones stop and the gravel road begins; but that was not the most challenging part of our day. On our way back, we were going to visit Veronica. We came to a house set about 8-10 feet below the level of the road. 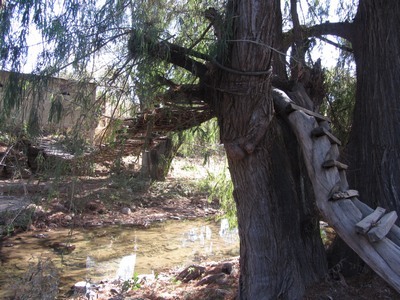 There was no obvious way to get to this house, still, it was apparent that someone lived there. 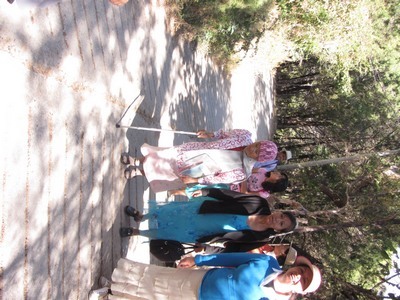 It was indicated to me that we should go down the hill, but how? Where? Never fear, there is always a way. In this case, it was a few tumbled rocks, next to an unfinished building foundation, that led to a dirt path with a trickle of water running down the middle. 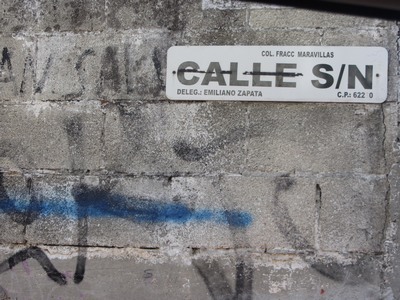 Now how was I supposed to know that this was the callejon (little street, aka alley) and not a drainage path???? 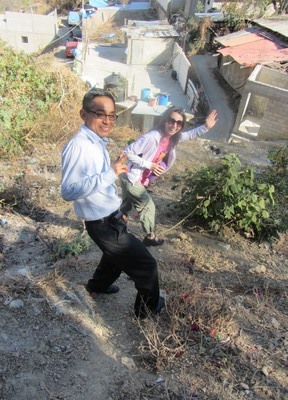 I followed Sarah and our Mexican companion and picked my way down the path, thinking we were going to the house, but noooooo! we walked right by, and then it really got interesting. Tame compared to where I was walking. 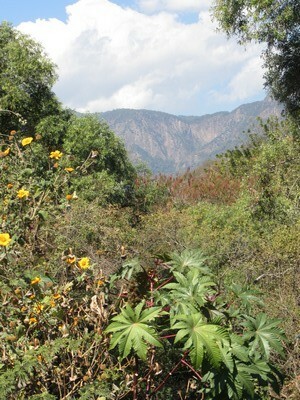 The path beyond the house dropped steeply down the mountainside. Now a mountain goat I am not, but believe me I needed to be as this path, all twelve inches wide of it, winds steeply, like the roads, down the hillside, with plants, most of which have some sort of burr or thorn, grabbing at you from both sides. 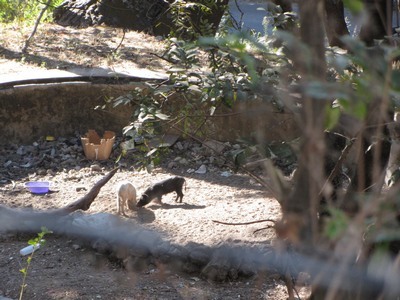 There were rocks in places, giving some footing in the loose soil, which cascaded down the hill as we walked; tree branches and even a discarded tire or two formed make shift steps along the way. Down, down, down we went, step by slow, careful step, when suddenly we came to a set of stairs. Oh good I thought, when just as suddenly as they started, they ended 50 feet (and one house) later at a 4-foot high platform which we had to scramble around, hands in the weeds, to get back to the path. After descending probably 300 yards in this fashion, we came to the house. 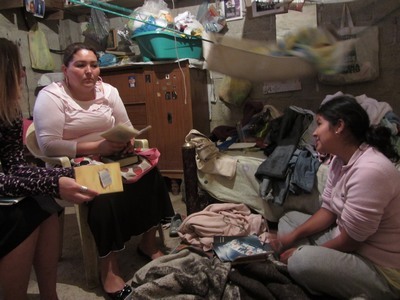 Veronica, her husband, and 6 month old son live in one room – about 12 x 12 or so – in a 3 room house probably shared with one or the other set of parents. When it was time to go, we stepped over the dog and scrambled up the dirt path with the rocks and sticks, around the base of the stairs to nowhere, climbing the hillside, up and up, over the old tires, until finally, all weak knees and out of breath (at least me) we reached the road at the top. I can’t imagine carrying a baby or groceries up or down this way, but they do. 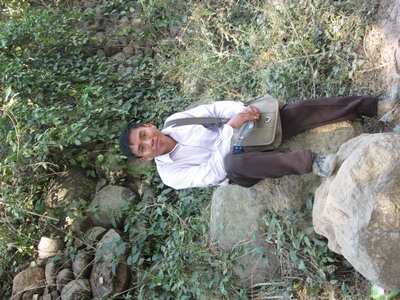 Later, our Mexican companion confided to Vanessa that she was worried about me the whole time. “What would I tell the brothers if I broke her?” she said. Today, I had the opportunity to view the path from a house across the way. Doesn’t look so bad from there! 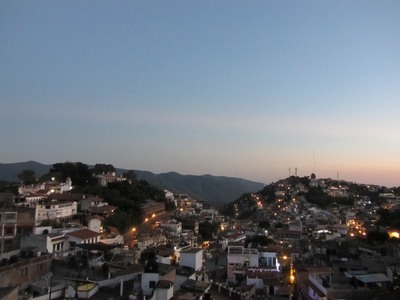 Taxco is not a small town, yet it is small enough that the residents (the permanent ones anyway) seem to know everyone. 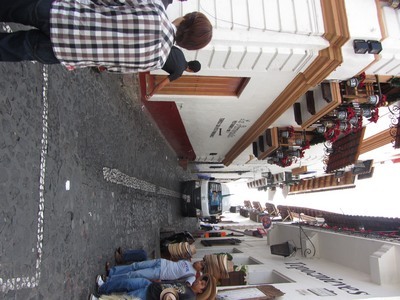 There are no traffic lights in Taxco, though there are traffic police that stop traffic on busy roads so pedestrians can cross. Other than that, it is pretty much a first come, first go philosophy, or the typical Mexican attitude of if you can squeeze your car into the space, do so. Add that to the general steepness of the terrain and as you can imagine this philosophy comes with a lot of horn honking and occasionally (amazing really how rarely), scraped paint, broken lights, and shouting. But having no traffic lights does not mean that there are no street signs. 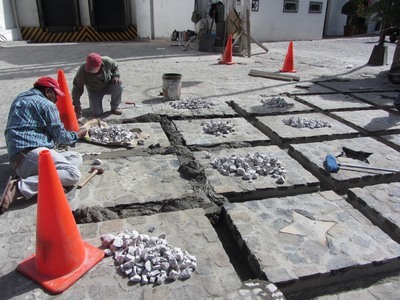 This being a colonial town, with the exception of the main highways into and through town, the streets are as they have been for centuries made of cobblestone.The road builders, set each stone by hand, and sometimes, using the three colors available (black, white, and red) take the opportunity to add some creative variety to their jobs by placing a pattern into the pavers. There are the typical white lines down the middle, supposedly the line demarks two lanes but usually they serve more as a guide for one car, as if it could not get around the bend without straddling the line. Other times, the lines form patterns — leaves, geometrics, even intricate pictures in stone outside businesses or in the plazuelas. Here are a few of my favorite street signs. enjoy the show. Last Week I was mountain climbing in Tetipak. 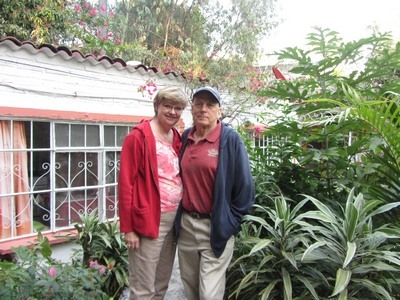 This week I went with Sarah on a short combi ride from Taxco to Cerro Gordo, where you can see for miles and miles. My friends and I visited a pretty pair of towns separated by a surprisingly clean, babbling river that cascades over rocks and 3-4 foot falls (at least this time of year) here and there. My companion and guide, Jorge’ (call me George), pointed to the mountain in the distance where the spring-fed source of the river could be clearly seen cascading in an arch, hundreds of feet high. (Look closely and you will see the white streak on the top right side of the closest mountain.) No wonder the water was so clean! 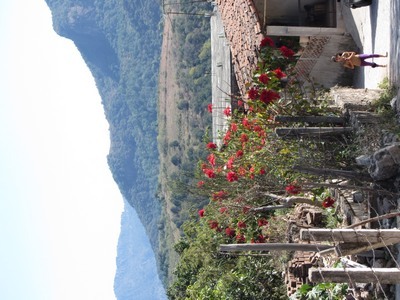 As with other twin cities, one seems to be filled with grande casas (houses) and rancheros, while the other seems to provide the workers and services. I thought a herd of cattle in the middle of town was interesting. And then there was the stream that ran across the main road and tumbled down a pretty little waterfall. Careful, don’t get your feet wet. There was even a bridge over the river reminiscent of an Indiana Jones movie, complete with missing slats but minus the deep chasm below. 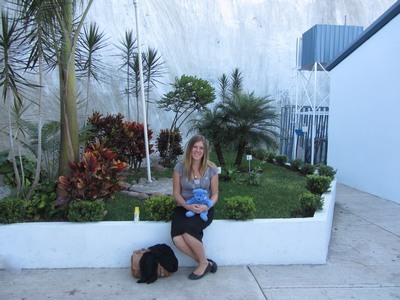 Of all the little off-the-beaten-path places I have been this trip, this was by far my favorite. 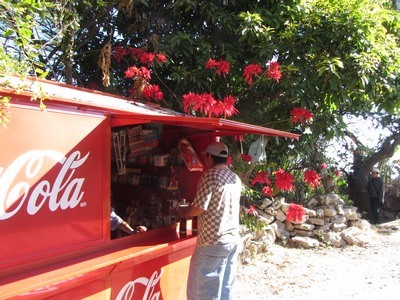 The streets and callejons were broad, the ups and downs not so steep, the abundance of flowers and greenery refreshing, and the cascading water provided musica naturale — ahhhhhh, a little taste of paradise. 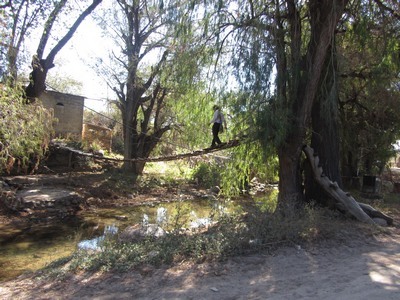 What was that about a rickety slat bridge? Someone recently commented on my adventures, saying I was only missing having “to cross a rickety bridge over a river chasm.” Well, guess what!!!! 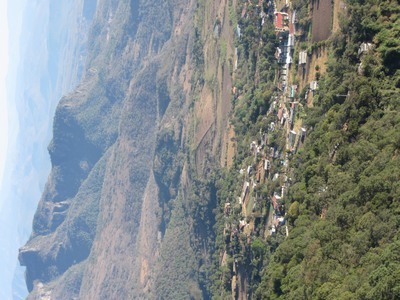 OK, it wasn’t quite a chasm but it sure was rickety. Monday night I was just dozing off, when the bed felt like it was shaking. At first, in my half daze, I thought is must be a particularly big truck on the street in front of the house, shaking the ground. The shaking stopped for a few seconds and then the house shook again, more mildly and without a sign of traffic anywhere. What I was feeling was temblors. 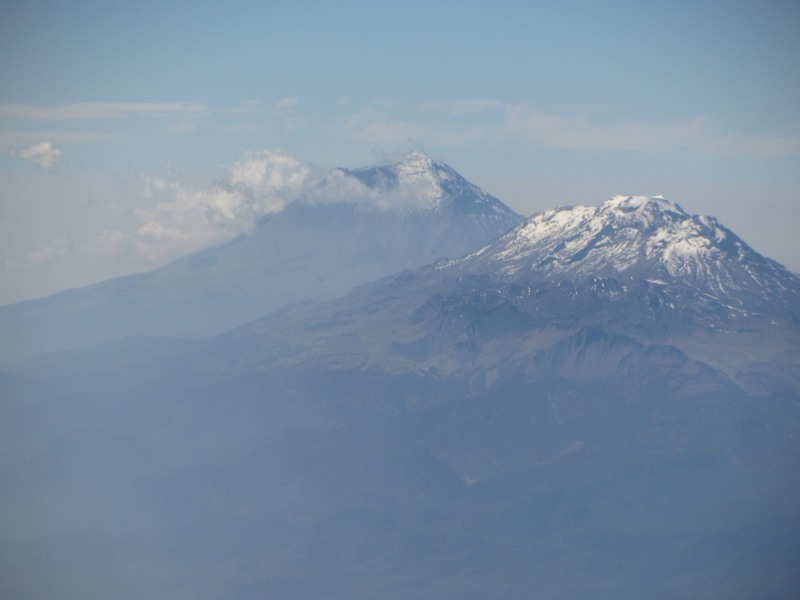 Popocatepetl must be trying to awaken his sleeping woman again. I was with Vanessa at the hairdresser’s last week, when the girl’s sister, Ana, invited me to go along on Saturday to a little town up the mountain, then have lunch at a sister’s home. Now I made up my mind a long time ago, that unless something is obviously dangerous, say “Yes” to any invitation, otherwise, you never know what great experiences you might miss. So I needed to get up early on Saturday, “dress for cold and hot” (whatever that means), and get to the opposite side of town, find a house I had been to once (which looks like every other house), to catch a ride to the town Tetipac (pronounced Te tee PAHK). We had to get going early because it was a good 45 minute drive to the top of the mountain and beyond — beyond all the towns I am familiar with, beyond the state park, Cerro del Huixteco (more on this in a future post), through the trees and the chilly air, and down the other side. 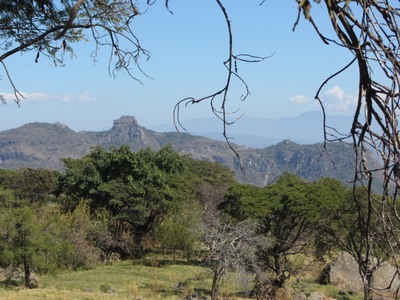 Now if Taxco is at 5600 feet or so, Huixteco has to be near an ear popping 7500 and the top of the peak around 8000 or so. 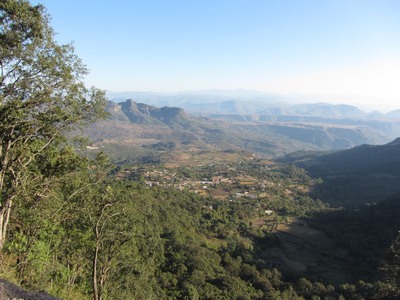 We were high, that fact made very obvious when as we were heading down the other side, parts of the road had washed away and we had a commanding view of the town waaaaaaaaaaay down below as well as the tableland and mountains in the distance. As we had gone up, up, up, we then started down, down, down, curving around and around — whether due to the curvature of the mountain or to switchbacks because of the steepness of the terrain, I was not sure (probably both.) At last, we reached the town and snaked our way steeply through the upper regions and down into a main business area hugging the side of the mountain. We turned left at an intersection, and immediately ground gears to crawl up the steeply pitched street and parked. The parking spot was at such an angle that someone had to hold the door as I tried to heave myself out of the back seat without falling back in. Safely out of the car, we then, walked still further up another steep grade to the top of a driveway, and you guessed it — what goes up has to go down, down, down, and down some more where at the bottom we crossed a stream on a couple of warped 2×12’s to come to the entrance of the house where the service meeting would be held. We and three people from the house next door climbed a set of stairs into the lower patio area of what used to be a very grand casa with a nice landscaped yard and a pool (it is still a nice house upstairs, but the pool would make a better sunken garden at this point.) At this hour and altitude, I became very aware of what cold meant as I shifted uncomfortably on the cold cement, trying to find a sunny spot to warm my toes. Soon, some others came, then more, and when there were about 20 or 30 of us all milling around, a brother got up on the steps above the group and said a prayer. Not speaking Spanish very well, I thought it was time to go in the field, but when I grabbed my bag and stood up again, lo and behold, breakfast was being served! 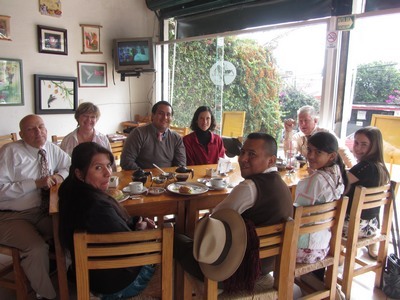 I was offered coffee (the weak Mexican kind), tea, tortas (sandwiches), and rolls. I had eaten before I left so I accepted a cup of hot tea (to warm my toes) and found it sweeter than any sweet tea served in the deep South. 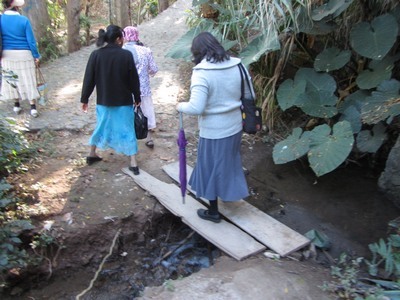 After everyone had eaten, the food was packed up, the brother said another prayer and we were off, two by two — down the steps of the house, down to the stream, across the wooden “bridge” and up, up, and up the steep driveway to the top. 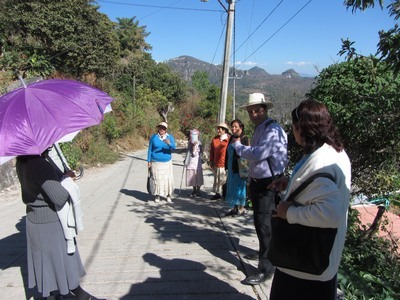 I was breathing heavy (not used to this altitude nor the “can barely stand up” steepness,) but if the 87-year-old pioneer sister with a cane could make the grade, I was determined to do the same! 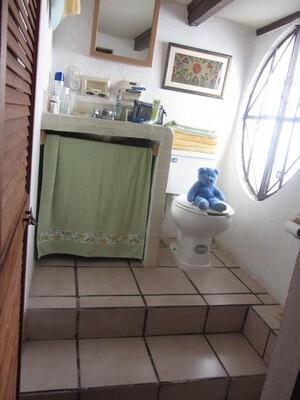 Now Mexican service is a little different than that of the US. Since there are few real blocks and lots of little callejons (alleys) to get lost in, everyone works house over house as a herd (or is that a flock?). 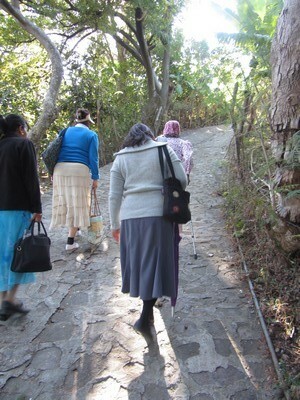 Most of the group went down the steep incline to the main residential street and started working up the mountain; nine of us sisters were sent down a dead end road and then were to connect with the main group when we were done. “So how does this work?” you say, since most Americans have trouble working house over house when there are just three people! 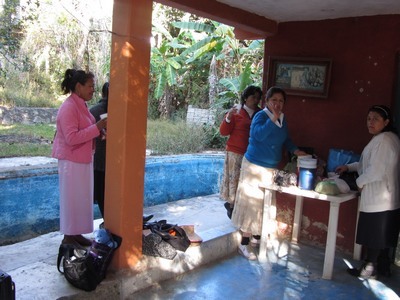 Well, the whole group walks along the street, and when a door to a house is found, two people peel off, knock and holler “Buenas dias!” and wait to see if someone comes to the door or sticks their head out a window above. 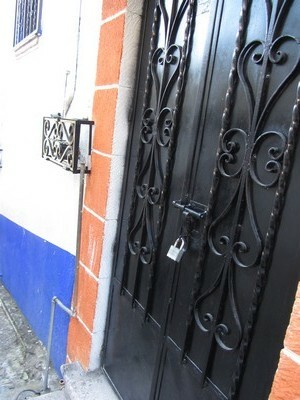 The rest of the group walks on, repeating this procedure (sometimes at doors within a few feet of each other) until they come to an alley or a fork in the road, then a 10-15 minute discussion ensues to determine if the alley is a real callejon with houses on it that should be worked or if it is even part of the territory to be worked, and if so who is going to go that way. The brother in charge, who is trailing the last members of his flock to be sure none get lost or left behind, usually arrives and reassigns groups of people to go each way. On this particular day, the sister I was with had a good call at the first house (also the location of a tienda, a shop – but in this case a metal box, with sides that open to vend novelties, snacks, and necessities; think of the food carts on State Street or at a carnival only without wheels) which meant that everyone else worked the dead end and then went to the main street and started following the other group up the mountain street. That left us dead last in the flock, walking and walking up the steep incline in the hot sun until we caught up with the rest of the group, deep in discussion over which way to go. Getting that straightened out, we walked and walked and walked up some more either finding no one home (found out later most of the town was at a funeral) or being behind the rest of the group, attempting to make it to the front where we might actually be able to call on a house (a flock of geese come to mind.) Then we came to another fork in the road. As we waited and discussed whether we should take the side street (callejon) even steeper up the mountainside, where there may or may not be a house, or the calle (street) that seemed to continue on a gentle slope heading down, a man and his wife came down the callejon (so there were houses up there). I seized the opportunity to try out my presentation in very limited Spanish and when I had no more words to use, the sister helped out. The man took the magazines and answered the question about whether anyone else lived up there by pointing to an old man, with one leg, one crutch, and a pile of firewood on his shoulders as he started down a “callejon” (more of a dirt path short cut down the mountain) into town. I dare you to try that on two good legs without any firewood! It was not long before the car and the combi that had given everyone a ride over the mountain, appeared, loaded us all up, then took us down, down, down some more where the real center of town was located (you know because the church is located there along with a small square of businesses), past the weekly market stalls to a house in the lower section where we were invited to lunch by a sister and her daughter. 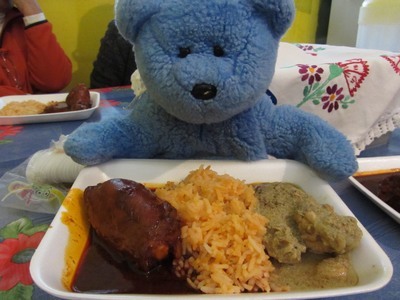 They served everyone the most delicious mole (both red and green), friole tamales, and rice. Mmm mmm good! Blue bear with red and green mole. Now, if you are wondering how you keep track of placements and not-at-homes in such a far flung, rustic place that may or may not have house numbers, well, you don’t. The territory is worked every week or two, so if you miss them this week, there is always next week and somehow all the sheep are found. 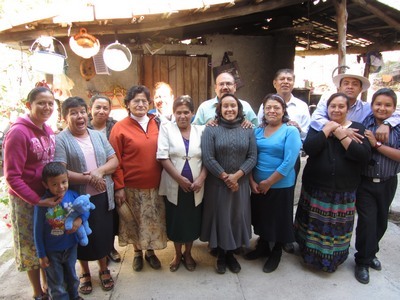 In Mexico, Christmas Eve and Day are a time for family. Since the whole country has at least two weeks if not a month off school and work this time of year, the whole family comes from far and wide to gather around the dinner table on Christmas Eve and share Christmas Day together, for the most part quietly. The children may receive a small gift or two, mostly from visiting relatives, but Three Kings Day (January 6) is the big gift day for them. Called Epiphany elsewhere, this is the close of the Feliz Navidad season that began on December 12 with the Festival of Guadalupe. The tradition holds that this is the day (12 days after Christmas) that the three kings (wise men or magi) arrived to present gifts to the infant Jesus. So,imitating the gift giving of the three kings, Mexican parents present gifts to their children (and each other) on this day. The night before, children set out their shoes and in the morning they are filled with small gifts, (The children of Latin America, as well as Spain, receive their gifts from the three kings rather than from Santa Claus) though now days the gifts may appear under a Christmas tree. It is interesting that in other parts of Europe (Russia and other Orthodox lands for example) that Father Christmas comes on January 6; that date having something to do with the change to the Julian calendar. 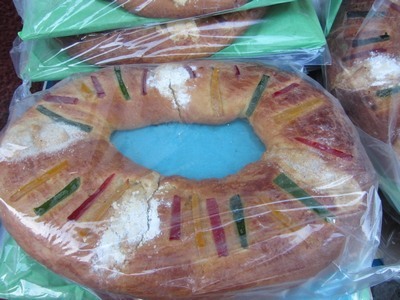 Three Kings Day is celebrated with the eating of a special bread, Rosca de Reyes (wreath of the kings). Baked as an oval, the loaf represents a crown and is decorated with colorful dried fruits and candies to symbolize jewels. Another Mexican tradition was also upheld, as I was awakened at midnight by firecrakers and cherry bombs going off in the callejon (alley) behind my house.